Meticulously Remodeled Downtown Victorian Charmer! Céad Míle Fáilte, "a hundred thousand welcomes," to the Northern Starflower! This beautiful Victorian home was owned by a ship’s captain, and then fully restored down to the studs for a perfect mix of old and new. Classic architecture with fresh furnishings make for a unique mountain getaway. This one bedroom, one bath home can house two to four guests with one queen bed and a sofa bed. Enjoy the quiet front or back yards, spacious and social kitchen and dining room, or the cozy sitting room. 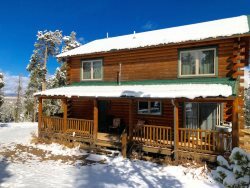 The home is equipped with WiFi, TV's and Roku for some entertainment after a long day of skiing, snowshoeing, biking, fishing, or hiking. In addition to Colorado's many adventures, the Starflower is only a few short blocks from our historic main street. Parking: Although not guaranteed, this home has room for approximately two cars to be parked in front of it. Leadville’s Victorian homes were historically built quite close together in the days before the “horseless carriage.” As such, parking can sometimes be a challenge. In the winter, maintaining an open parking space can cost homeowners a significant amount of money and/or hours spent shoveling. Please take these things into consideration as you plan your trip, and be courteous to your local neighbors by trying to park directly in front of the home you have rented. 6/2016: "This place is PERFECT for Leadville Race Series. We enjoyed being here SO much! Will be back!" 9/2017: "My boyfriend and I enjoyed a wonderful weekend exploring Leadville from our home base at Northern Starflower. Melissa was very accommodating with our short notice reservation, and the location is just a short and sweet walk from all the restaurants and shops in town. We will be back to see more of this Colorado gem and Id recommend my friends and family to reach out to Aspen Leaf Properties in the future!"